Realized price for Wavecrest Pin Holder. 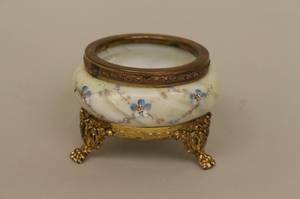 Footed small bowl form container decorated with small blue flowers. Raised on three metal paw feet decorated with medallion and leaves. Marked on bottom with red Wavecrest banner mark with "TRADEMARK" and "THE C.F.M. CO". Height 2.3 inches. Archived auctions similar to Wavecrest Pin Holder.